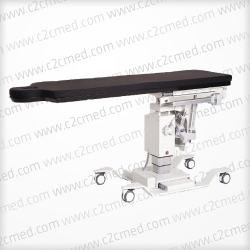 The Maquet 1130 is a mobile operating table with battery powered electrically controlled hydraulic drive. The tabletop is subdivided into up to 8 sections. 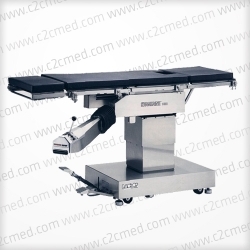 The Maquet 1130 is a mobile operating table with battery powered electrically controlled hydraulic drive. The tabletop is subdivided into up to 8 sections. Integral foam pads, radiotranslucent and electrically conductive. The padded plates for upper and lower sections and seat plate are individually removable. 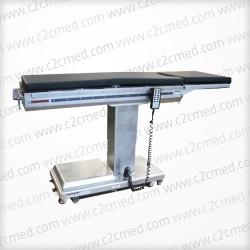 Base and column cladding and the table frame with guide rails for X-ray cassettes are made of CrNi steel alloy. 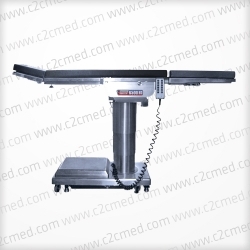 The operating table rests on a T-shaped base with large, easy-rolling, ball-bearing castors for lateral and transverse motion. 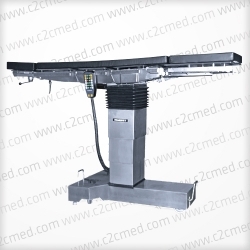 Castors are accessible for the side for disinfection and maintenance.